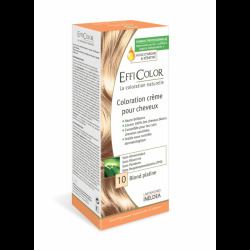 Coloration crème pour cheveux: AQUA/WATER, SODIUM COCO-SULFATE, ETHANOLAMINE, MYRISTYL ALCOHOL, CETEARYL ALCOHOL, COCAMIDE MEA, TOLUENE-2,5-DIAMINE SULFATE, COCAMIDE MIPA, COCAMIDOPROPYL BETAINE, OLETH-20, p-AMINOPHENOL, TETRASODIUM EDTA, SODIUM SULFITE, BISAMINO PEG/PPG-41/3 AMINOETHYL PG-PROPYL DIMETHICONE, VITIS VINIFERA SEED OIL, 2-METHYLRESORCINOL, HC RED NO. 3, HC YELLOW NO. 2, ACRYLATES/CETETH-20 ITACONATE COPOLYMER, 4-AMINO-2-HYDROXYTOLUENE, OLETH-5PHOSPHATE, 4-CHLORORESORCINOL, HYDROLYZEDKERATIN, ARGANIASPINOSAKENRELOIL, SODIUMCOCOYL HYDROLYZED WHEAT PROTEIN, 2-AMINO-4-HYDROXYETHYLAMINOANISOLE SULFATE, DIOLEYL PHOSPHATE, PHENYL METHYL PYRAZOLONE, 2-AMINO-6-CHLORO-4-NITROPHENOL, BUTYROSPERMUM PARKII BUTTER, PEG-10 OLIVE GLYCERIDES, POLYSORBATE20, ASCORBICACID, m-AMINOPHENOL, ERYTHORBICACID, BUTYLENEGLYCOL, HELIANTHUS ANNUUS SEED EXTRACT, PRUNUS ARMENIACA KERNEL OIL, PRUNUS PERSICA KERNEL OIL, SIMMONDSIA CHINENSIS SEED OIL, CITRUS MEDICA LIMONUM OIL, CITRUS NOBILIS OIL, CITRUS GRANDIS PEEL OIL, PARFUM/FRAGRANCE.